For the past four weeks I have done so much has been hard to get myself to write a blog post because it feels like we are never sitting down and we are always out exploring this great city. 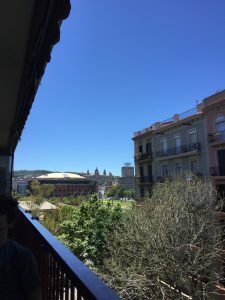 Over the course of my trip so far I have been to not only all around Barcelona, but to multiple other places in Spain and even into the south of France. Since I have visited so many places I figure that I will recap each place and show pictures of the many places that I have been. The first picture is the view from my apartment. We live by Parc Joan Miro and Plaza Catalunya, and this really cool shopping center that was once a bull fighting arena. This is a really cool area with good food and even an awesome art museum to visit. A few days after we arrived I went to La Sagrada Familia, the church designed by Gaudi. This was an incredible experience. The pictures don’t do justice on how big this actually is. We learned about the history of the church as well as all the symbolism and attention to detail that was put into every aspect of the design. 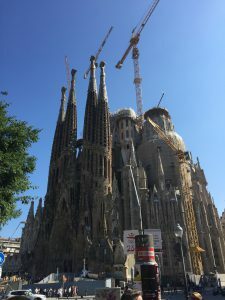 They are not even finished with La Sagrada Familia yet, but they have plans to be done by 2026, celebrating 100 years after Gaudi’s death. Next me and my roommates decided to explore the Labyrinth Park of Horta which was an interesting experience. The Labyrinth wasn’t as large as we expected it to be, but we still ended up getting lost a few times and taking the wrong way a lot. We ended up making it through and it was a pretty cool little place to visit sort of away from the city. 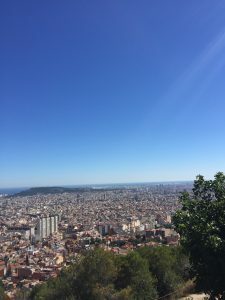 The next big thing that I did, and it is probably one of my favorite things is visit Park Guell and Bunker. 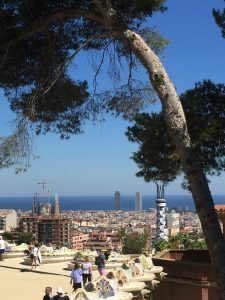 Park Guell is a great place to see the city of Barcelona, and get a great picture on a bench designed by Gaudi. Although we didn’t pay to get the picture on the bench we still got a good view of the city, but then we continued over to Bunker, which was an even better view of the entire city. Bunker is just an old bunker on top of hill at the edge of the city where you can get a great view of the whole city, and we stayed up there for an hour just taking in the views. The first picture is one of Park Guell and the second one is a picture of Bunker. My next activity will be a trip to the South of France I will end my blog here and write about my explorations outside of Barcelona in my next post! This entry was posted in Uncategorized by b0powe04. Bookmark the permalink.